Holiday lights can interfere with wi-fi in rare cases. Are Your Holiday Lights Slowing Down Your Wi-Fi? It’s the holidays, you could use a few more things to worry about, right? Perfect, here’s a good one: Depending on what type of holiday lights you use to decorate your house, they could cause interference and a dropoff in your Wi-Fi speed. First of all, let’s all appreciate that holiday lights are called fairy lights in the U.K. Second of all, is this really something we have to worry about? The wiring in holiday lights is often unshielded, which can result in electromagnetic radiation along the wire creating an electromagnetic field. Therefore, proximity is a major factor in whether interference will occur. You’re more likely to have an issue if your microwave and router are right next to each other than if they’re far apart or in separate rooms. The type of decorative lights you’re using also affects the likelihood of slowing your Wi-Fi. The older technology that was used to make the lights blink can indeed cause radio interference. Most modern Christmas tree lights are based on solid-state LEDs and often use an external electronic flashing controller and do not create radio noise. However, there are some LEDs that have an additional blink-controlled chip right inside the LED bulb. It turns out that these devices also create significant radio interference as this internal controller cycles the LED chip from on to off. It’s unlikely that you’ll notice a significant drop-off in your Wi-Fi speed, but if you do you can try keeping decorations away from your router, switching it to the 5Ghz band (if possible), or replacing your lights as a last resort. LED models that don’t blink are the safest choice. 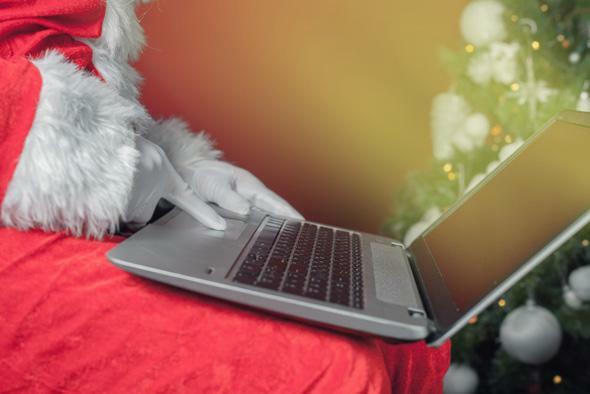 If it makes you feel better, a senior telecom technician told the Irish Times last year that holiday decorations are “unlikely to have a significant effect” on Wi-Fi speeds, so you probably won’t notice anything unless you’re extra lucky this year.